This is a lesson plan that explores principles in civil engineering and architecture, developed to help teachers integrate engineering practices in the secondary classroom. Students work in teams to design and build a small dome frame out of everyday items that can hold a weight on top without collapsing. The driving question of the lesson: How do civil engineers design and build domes, taking into consideration the forces of compression and tension? The lesson follows a module format that includes problem sets, student guides, recommended reading, illustrated procedures, worksheets, and background information about the engineering connections. 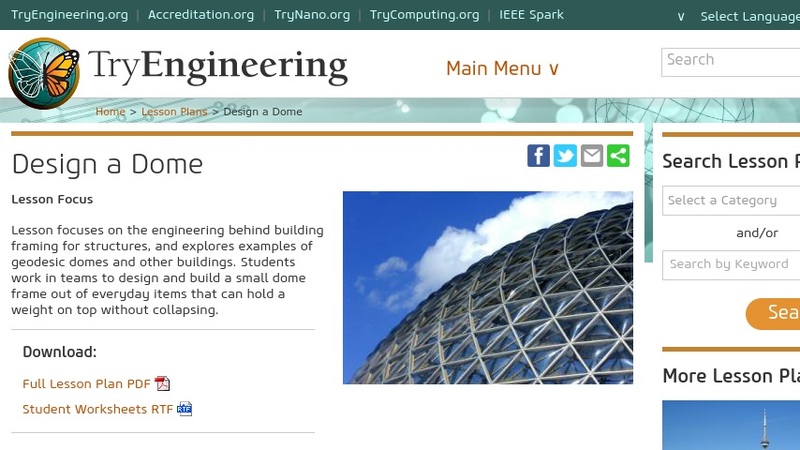 This resource is part of TryEngineering.org. Editor's Note: Teachers: Try combining this lab with interactive digital labs on forces and structural materials. See Related Materials for links to two editor-recommended web resources from PBS and Teachers' Domain.